East Coast Heritage Rail are proud to present the newest addition to our range of regular heritage rail day tours, the Hawkesbury River Express. A relaxing day tour behind a vintage diesel locomotive and featuring restored carriages from the 1920’s, 30’s and 40’s, the train departs central around 9:50am* and traverses the spectacular Ku-Ring-Gai Chase National Park to the gateway of Sydney’s hidden scenic waterways – the Hawkesbury River. 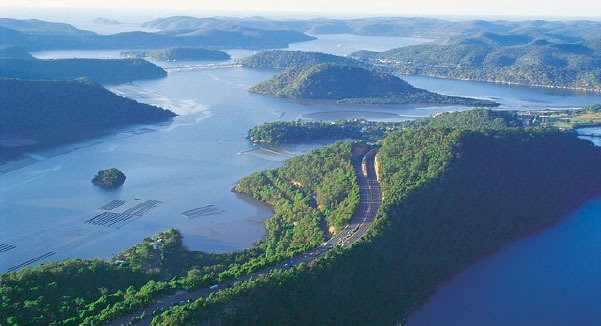 Here you are presented with the option to continue on to Gosford for lunch or combine your train ride with a relaxing lunch cruise exploring the gorgeous bays and pristine inlets of the Hawkesbury River aboard the famous Riverboat Postman. The last river postal service still active in Australia having operated since 1910, the Riverboat Postman continues to deliver mail, groceries and essentials to the population scattered upriver from Brooklyn over its leisurely 40km journey. Operated since 2001 by Hawkesbury Cruises, the service now doubles as a tourist experience including morning tea and a Ploughman’s Lunch (the boat is fully licensed), complete with commentary about the area and history from the skipper in addition to the very finest scenery that only the Hawkesbury can offer. Our train is also equipped with a Buffet Car serving tea, coffee, light refreshments and snacks throughout the trip and returns to Sydney Terminal by around 4:15pm* – we hope you will join us for a relaxing day out! Seated and Lounge Class tickets available – Seniors, Group and Family discounts are offered and Carriage Hire can be arranged by enquiry.